So we're 2 weeks into 2018 already. Did you set a New Years Resolution, or some new goals? It's now, as we head back to work after the Christmas break that the reality of everyday life sets in, that we make or break our intended changes to our lives. Aside from new goals etc, January is a great time for having a de-clutter and making space for all that the new year will bring. Of course you can do this anytime of year when you're feeling snowed under too. Why try for a fresh start? We've just had a break, so we're nice and refreshed. Coming back to mess and clutter is overwhelming and distracting. A good de-clutter can help you focus on your top priorities and current goals. A bit of maintenance on your filing and systems now will save a heap of time later when it comes to finding things. Some to-do list apps let you forward emails to them so that the emails you need to action are in your to-do list rather than cluttering your inbox. Delete, Delete, Delete! Anything that you don't need to file for future reference. Scan each file to make sure the contents are current, relevant and still needed. Things like expired insurance policies, warranties and papers for items you don't own anymore can be tossed. Information about events that have already happened, could also go. If space it tight in your filing cabinet, consider archiving some older files that you still need to keep but don't refer back to. Tax records for past years and receipts from older renovations are good examples. Move them into an indexed box and store it somewhere out of the way. Pull out any rusty or bent hanging files that don't slide well and replace with new ones. Anything like this that makes filing harder will deter you from keeping up to date. Always add new papers to the front of a file, so when you're cleaning out you always know that the oldest will be at the back. This is something that can sometimes get cluttered without you realising, because it's not a physically bulging drawer. But excess files and software can slow your computer down when searching and just in general. I shared a post a while ago about how to uninstall software you're not using. I check this at least once a year to see if I can get rid of anything. Check your Downloads folder. Every time you download a file from your email or elsewhere online, it usually defaults to save here. This can quickly get very cluttered. Go through it and file or delete everything. Your Desktop can get cluttered too. Check if anything there can be filed or deleted. Check the folders that you use all the time. Have a quick tidy up. Do you need to add extra folders to help find things easier? Can you move some folders that you don't use anymore into an "Archive" folder? Or delete all together? This is where you want to come in and be able to focus on exactly what you need to do. You need to be able to easily find the files and tools you need to get your work done. Things will na turally get messed up as you work and you may do a quick tidy at the end of each day, but when was the last time you had a proper de-clutter? Is there a filing pile that's looking like the Tower of Pisa? If you've cleaned up your filing cabinet as above, then this will now be much easier. You may even be able to toss some things from this pile instead of filing? Stationery. Clear out the stationery items on your desk that you haven't used in months. Either move them back to the "supplies cupboard" or move them on. Then make sure you have enough staples, post-its and any other supplies you use regularly. Current project notes. Time to put away the notes from past projects, and check that the papers you have for current projects are still useful and relevant. Then make sure the rack/tray/folder/drawer you are using to hold these notes is doing a good job. It's amazing how long we can put up with dodgy tools when we don't stop and think about it. Cleaning. Empty your bin/shredding, give every surface some dusting and a wipe down. Don't forget your keyboard and mouse, these can get filthy! Knick knacks. I'm all for having a few items to personalise your space, but if they're making the space too "busy" then it could be messing with your productivity. I also try to change up any inspirational quotes or goals that I have on display. I find that after a while I get blind to them and they lose their effectiveness. It's very common to want to make big changes in habits and routines at this time of the year. And there's a reason there are so many books and articles about changing habits, it's quite hard to do! So here are some tips to give you the best chance possible to make these changes stick. Try to pick one habit at a time to change. The reason habits are habits, is that we can do them on autopilot and it doesn't take much energy or focus. Trying to completely overhaul your lifestyle takes alot of energy and isn't sustainable. Eventually we run out of willpower and fall back to the old habits. Choosing one key habit to change gives us one thing to focus on, giving us more chance of success. Then that success can motivate us to change the next habit after that! Link your new habit to an existing one. This is why I keep my vitamins with my toothbrush and some moisturiser in my bedside table. Every time I brush my teeth I remember to take my vitamins. And when I hop into bed and get out my book, I'm reminded to put on moisturiser when I see it in my drawer. So if you want to start planning your day first thing each morning, tie it to your morning coffee habit. Find a way to make it enjoyable. This doesn't need much explaining, it's always going to be easier to do something you enjoy. If you want to exercise more, find an activity you enjoy doing. Or at the very least do it with your favourite music or audiobook playing. Another trick to try is to put a big cross on your calendar every day you complete the habit and try not to break the chain. It's oddly satisfying to see a calendar fill up with your desired new habit. This one is also known as the Jerry Seinfeld Productivity Hack. Set an alarm or reminder and if needed, include the reason WHY you wanted to make this a habit. For example I want to keep my filing up to date weekly so it only takes 5 minutes and I can always find everything. 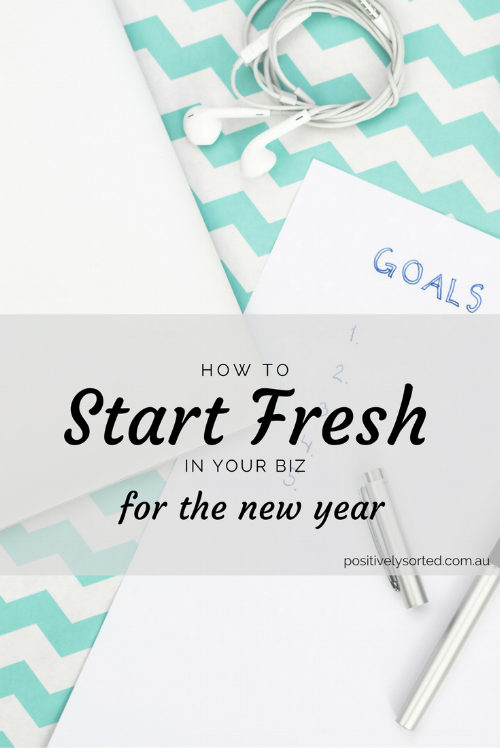 Tell me in the comments or over on the Facebook page, are you setting up for a fresh start this month? What areas are you focusing on? Need more help figuring out where to start or with the nitty gritty of getting it done? Schedule a quick free call with me to see what we can do together. Click here to book.